There are various ways to fix your camera onto your telescope. 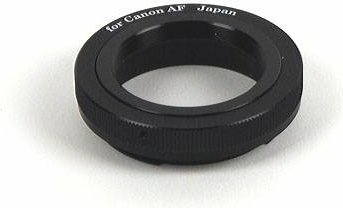 A frequently used technique is the use of a T2-ring + Camera Adapter. This involves placing your camera directly in front of the telescope. 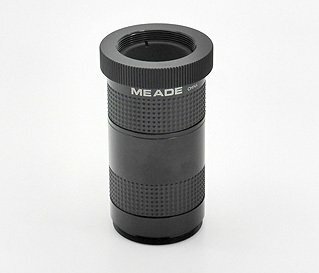 The telescope lens then replaces the camera lens. The first component is a so-called T2-ring. The T2-ring connects your camera to the camera adapter. You can then fix the camera adapter onto the telescope. 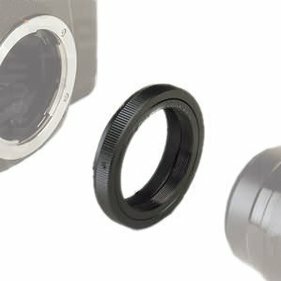 Most camera adapters are equipped with screw thread on the inside enabling you to place a Barlow lens. This way, you will be able to approach the object even closer.